This yummy bread has been a bit of a go-to in our house when we need breakfast on the run - it is delicious heated with a little spread of coconut butter! It always works out perfectly and it is without the gluten, refined sugar and dairy products- all you need now is a cup of tea! P.s. Feel free to experiment with raspberries in place of the blueberries. Grease and line a large loaf tin and preheat your oven to 170 degrees. Mix together all the wet ingredients (coconut oil, mashed bananas, blueberries, sweetener, eggs, baking powder and lemon juice on top of baking powder to activate it) and once combined mix into dry ingredients and fold until just combined. Pour mixture into cake pan – smoothing the top with the back of a spoon. Top the cake with more blueberries (if desired) and place into the oven for about 45- 1 hour minutes until the cake springs back when touched in the centre and sides. Enjoy! As the temperature drops I find myself wanting warm and super nourishing fuel to fill me up for the day and happily this bowl of goodness is just the ticket. Made with raw cacao and coconut mylk it is left in the fridge to plump up overnight and then gently reheated for breakfast, brunch or even lunch. It seems unfair to call this a recipe but more of a base to work with (the oats, coconut and coconut mylk) and then add your own take on it. Sometimes maybe some frozen organic raspberries in the mix, maybe some cacao nibs, maca or even omit the cacao altogether and use matcha green tea powder. Mix ingredients together in a container with a lid. Leave in fridge overnight to make it thick and fluffy for the next day. Gently warm in a pan on the stove with an extra splash of coconut mylk if desired and serve with berries or figs if you have them. Other combinations that are delicious are: matcha green tea and vanilla bean, coconut and raspberries, maca and nut butter. Enjoy! If this isn't proof that the easiest things in life are the best then I don't know what is! 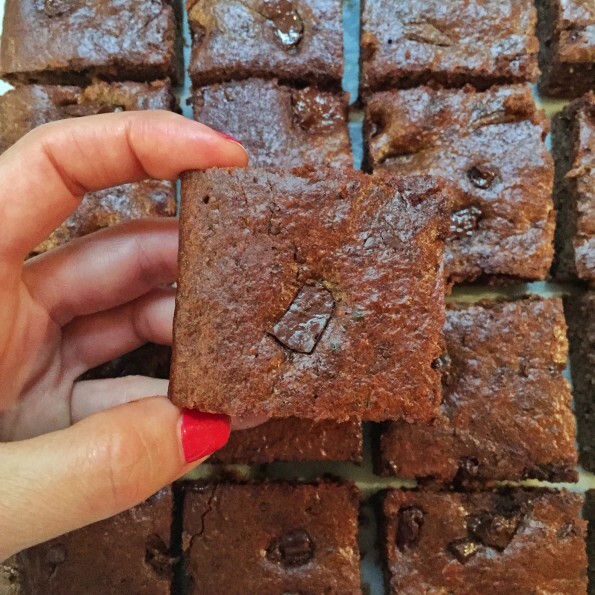 Who knew you could make brownies without even a scrap of flour? So simple and totally delicious. Preheat oven to 160 degrees. In a large bowl mix fold the bananas, coconut oil, eggs and the nut butter together. Add the rest of the ingredients – reserving a few tablespoons of chopped chocolate for sprinkling on the top. You could also use nuts to decorate as well if you wish. Be careful not to overmix as this will keep the batter nice and fluffy. Then spoon into a prepared and baking paper lined 24 inch baking tray. Sprinkle top with remaining chocolate and bake for 25-30 mins in a 160 degree oven. It is done when you can touch the top and it springs back. Cool in tin and then cut into slices. Enjoy! These little babies are just perfect on chilly nights to indulge your sweet tooth while also being gluten free, sugar free, dairy free and totally delicious! In a bowl gently mix all ingredients. Spoon into individual cake patties and bake in an 180 degree oven for 25-30 minutes until the skewer comes out clean. Leave to cool completely before icing them. Place all ingredients into the food processor adding a little coconut water until it moves around well in the food processor and is nice and smooth. Spoon into a piping bag and refrigerate for 1 hour to firm up. Cut piping bag and ice cakes in circular fashion and finish at the top. Sprinkle cacao nibs on top and enjoy! Blend all ingredients in a high powered blender (we used a vitamix) until smooth. top with shredded coconut if desired. Enjoy! Preheat your oven to 180 degrees prepare a round cake tin with non stick paper. In a large bowl mix all the dry ingredients and spices. In another bowl mix the eggs, melted coconut oil, nut milk, orange zest and vanilla bean paste. Whisk to combine the wet ingredients and the add to the dry ingredients with the activated baking powder. Add in the raisins and walnuts and pour into your prepared tin smoothing the top with a spatula. Bake for 45-55 minutes depending on the size of your cake pan. It is cooked when it springs back in the centre when touched. Cool on wire rack and ensure it is completely cold before icing it. (Side note- I didn't wait as we were running exceptionally late for our friend's birthday and as you see in the picture it kinda came out everywhere- looks kinda great but not ideal for transportation! The lesson- be patient! Anyway, I digress. Back to the cake). To make the icing blend all ingredients in a high powered blender (like a vitamix) until velvety and smooth. Place mixture into the fridge to firm up before icing the cold cake. Decorate with fresh berries and flowers if desired. Enjoy! *If you want to make a layered cake as seen in the picture you can just double the recipe and make two and then sandwich them together with more icing. In a food processor place all base ingredients and pulse together until mixture comes together but just enough so that you still have some chunky nut pieces in there. Press into a 20cm lined tray and smooth with back of wet spoon and place into the freezer to set. For the topping combine all ingredients into a clean food processor and blend until super smooth- you will need to scrape down the sides and ensure all is combined and a silky texture. Pour into the semi frozen base and smooth over. Next make the swirl topping: in a small saucepan combine ingredients and then melt together. Use a whisk to bring together and then pour in lines on to the top of the slice - to get the swirl texture you can use a toothpick to swirl patterns. Place into the freezer covered to set and then slice into pieces. Will keep in the freezer for two weeks or the fridge for one week. Enjoy! In a large soup saucepan melt the coconut oil and add the onion slices and fennel bulb slices over a medium heat. Turn the setting down to low and caramelise these for 20 minutes until soft and golden - stirring to ensure the slices don't stick every few minutes or so. Then add the remaining ingredients (reserve the cheese for topping) and bubble away until the soaked lentils are cooked – 20 or so minutes or 10 minutes if using tinned lentils to allow the flavours to develop. Add some water to the potato starch and stir into the soup. Cook for a few more minutes until it thickens slightly. Remove star anise, cinnamon and bay leaves and serve in large bowls and top with hard and salty cheese like parmesan if desired. A really delicious and warming soup - perfect on a chilly winter’s eve! Mix all ingredients in a bowl until well combined. Pour into a lined cake loaf tin and bake in the oven until middle bounces back approx. 45 minutes to an hour- depending on size of your cake tin. Leave on rack to cool down or place covered in the fridge so that it cools quickly. Make sure your cake is completely cold before icing it. Blend all ingredients in a food processor until smooth and creamy. Spread on top of cooled cake and use cacao nibs for a choc chip crunch if desired. Enjoy with a big smile knowing it is refined sugar free, gluten free and naturally dairy free! As it cools down there is nothing better than being toasty and warm indoors - granted that the Gold Coast doesn't get that cold but I am loving these crisp mornings and cool evenings. I have been hankering for something to have with a cup of tea and these re worked gingernuts are naturally grain free, refined sugar free and also dairy free are perfect! They a yummy snack on the go or perfect to accompany you while curled up with a book on a rainy day. You could even add to them - pecan pieces maybe some cacao nibs- they would work well with whatever you have on hand. To make them chewy just bake them for a few minutes less or if you perfect them for dunking and for crunch them go a few minutes longer in the oven. Enjoy! Preheat oven to 180 degrees and line two trays with greaseproof paper. Mix all dry ingredients together and then add the syrup until combined. Mixture will look like wet sand. Form dough balls with your hands and press onto tray - flatten with back of your hand. Repeat leaving a little space between each bikkie. Bake in the oven for 12 minutes until golden on the edges- if you prefer a little crispy keep in there for a few minutes longer. Cool on a wire rack and keep fresh in a air tight container for up to one week. Preheat oven to 180 degrees and grease skillet with butter or extra coconut oil. Chop two apples into chunks and the remaining one into slices to top the cake. Toss the apple in the lemon juice to stop it from browning. Keep the slices to one side. Mix together all the dry ingredients and whisk to ensure there is no lumps. Mix together wet ingredients and and whisk to incorporate. Blend the two together and fold in the apple chunks. Do not over mix. Once combined spoon into prepared pan and smooth with the back of a wet spoon. Top cake with the reserved apples to decorate. Bake in the oven for 35-40 minutes or until bounces back when pressed lightly. When you need a little sumthin sumthin after dinner or perhaps at the three o'clock slump - these delicious morels will have you covered. They are naturally refined sugar free, gluten free, dairy free as well as being filled with good healthy fats to keep you feeling full (and prevent multiple trips back to the fridge) and totally vegan to boot. Wooot! 1/2 cup of extra nut butter at room temp. Mould the chilled nut butter around the macadamias so they are no longer showing (you may wish to wear plastic food gloves as it gets a little messy). Pop onto a tray lined with greaseproof paper and put into the freezer while you make the chocolate. In a bowl whisk together the melted cacao butter and coconut oil and add the rice malt syrup (or you could use maple syrup). Add the cacao, sea salt and the extra nut butter and beat with whisk until combined. 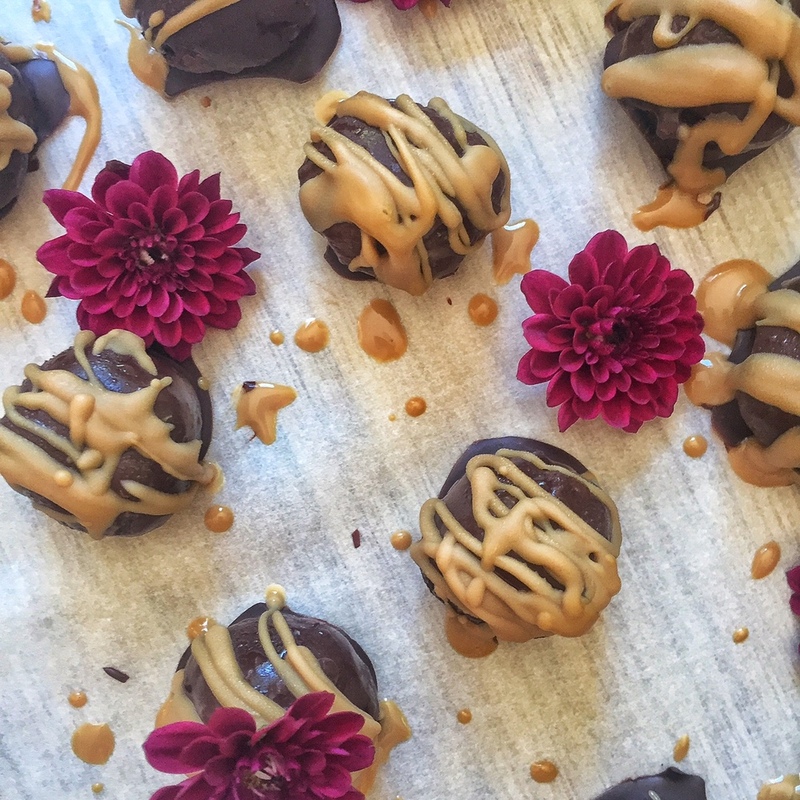 Drop the chilled nuts covered in the nut butter into the chocolate and then fish them out with some small spoons onto a wire tray with baking paper underneath to collect all the drips. The chocolate will begin to harden as the nuts are cold - if you want an extra thick layer feel free to dunk them again once you are finished the first dunking. Melt the loving earth raw caramel chocolate and then drizzle over the top. Voila! Enjoy. Do you love sweet potato fries but they always come out a little soggy? Booooo! We have just a simple and delicious recipe that will ensure you get golden and crispy little fries every time! Also did you know that they are also one of nature's unsurpassed sources of beta- carotene and serval recent studies have shown the superior ability of sweet potatoes to raise our blood levels in Vitamin A. To ensure you receive all the nutrients from this lovely root veggie be sure to include some good fats to enjoy all of its vitamins and benefits. This recipe uses coconut oil to keep it vegan and totally lip smacking-ly good but you could use ghee if you wanted to (it adds a nutty sweetness too). Pre heat oven to 200 degrees. To make the chips cut sweet potato into 1 cm battons and grab a plastic bag and place the corn flour and the seasoning (salt and pepper) into the bag. Mix around and then pop in the sweet potatoes and shake to cover in the flour mix. Dust off and place on a baking sheet leaving a little room between each row of chips. Spoon on the coconut oil and toss to coat lightly. Bake in oven for 15- 20 minutes until soft turning over half way though to ensure all sides get toasted in the coconut oil. To make the cheesy vegan sauce place all ingredients into a small bowl and mix until thinned out and a creamy consistency. Enjoy and eat piping hot! Happy New Year to everyone! Welcome to 2016 and in our house this means pancakes are the order of the day - specifically ones that are filled with goodness and wholesome ingredients while still tasting delicious! These work equally as well as pancakes or also as waffles so if you have a waffle iron and you are itching to use it then here is your chance - just make sure to lightly grease the iron with a little coconut oil beforehand. Mix all ingredients in a large bowl. Heat up your pan and add a little oil- cook in small batches once pan is hot- flip once bubbles appear on the top. Keep them warm in the oven while you complete the pancakes. 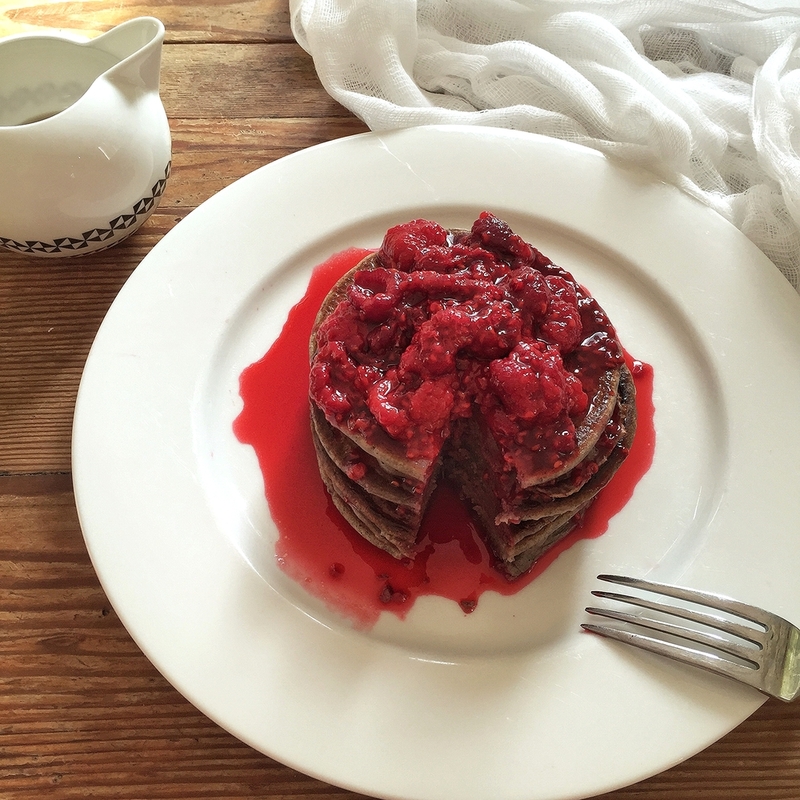 To make the raspberry sauce - heat in a pan on low and squish with a fork once soft. Serve immediately on top of pancakes with extra maple syrup if desired. YUM! Blend all ingredients in a high powered blender or Vitamix. Serve in your choice of bowl and top with your favourite things (we used chia, pecans, white mulberries, fresh figs and mint) or pour into wide lip jar or drink bottle for nutrition on the go. Enjoy! Blend all ingredients in a blender until smooth and then pour into a bowl and top with your favourite goodies. If you have been a Kombucha addict for sometime now and started to make your own you will have no doubt noticed the long strands of yeasty bits that come from your SCOBY. We like to use everything in house and have a policy of as little wastage as possible (read using the tea leaves to fertilise the gardenias among other things). You can also put these naturally occurring yeasts to good use and make delicious sourdough starter and capitalise on Kombucha's naturally sour flavour. Using a whisk beat the dregs and the flour together to get the naturally occurring yeasts in to the mix. Cover with the cloth and set in a warm place to rise for about 24 hours. You will see bubbles forming and a sour sweet smell from the starter at this point. From here you can use it at this point or you can feed it to give it a stronger Kombucha sourdough flavour. To feed your starter, mix 1/2 cup starter, 1/2 cup flour and 1/2 Kombucha dregs. You can build your starter by mixing an equal amount of starter, flour and dregs. If you need 2 cups of starter for your recipe, you’ll want to combine at least 1 cup starter, 1 cup flour and 1 cup water. Once it has doubled, then bake at 180 degrees for an hour. It will keep for up to a week without refrigeration. This is a great smoothie recipe with a secret ingredient... Cucumber. Trust me the husband/ kids/fussy eater won't even know they are consuming so much goodness as it tastes so yummy - all hail the humble frozen raspberry. Place all ingredients into your blender and blend on high until smooth and fluffy. Enjoy with a smile.